Silicone-Elastomer-Coated Foley Catheter: An Innovative Manufacturing Process Provides The Maximum Amount Of Silicone Coating Available. 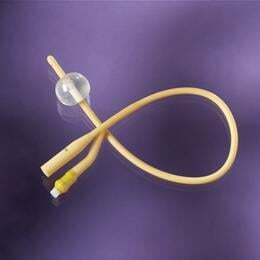 Latex Catheter Coated Internally And Externally In 100% Silicone To Resist Encrustation And Bacterial Colonization. 2-Way Foley. Sterile. 2-Way, Foley, 3Cc Balloon, With Stylet, 6Fr.